I have my favorite running store to thank for the random purchase I made of a PROBAR Lemon Fruition snack bar. It was up by the register as I was making a purchase of another amusing BondiBand or something of the sort. Lemon. Gluten-Free. Healthy. SOLD. Literally. Out of the display and onto the counter for purchase. This happily returned home with me. But I am the ultimate hoarder of snack bars (not really…I just buy them en masse) and some are way better than others. But you have to take that chance and buy one before you can decide whether it was worth the money or not. So into the drawer this went while I went through those that came before it. But last week as I was gearing up to head to Disney World for a half marathon, I was trying to not buy snack foods for work. So, the items in my pantry and snack bar drawer were what I was working with. Lo and behold…the next one up was this little lemony delight. PROBAR Fruition is the newest and latest gluten-free addition to the PROBAR lineup. This snack bar is entirely fruit-based and designed to be satisfying without extra fat and calories. You gotta love that. In fact, each bar guarantees one complete serving of fruit, only 160 calories, 4 grams of filling fiber, 2 grams of fat, gluten-free, and that it is loaded with antioxidants and omegas from the addition of chia seeds. These bars are also certified organic. Love that. All day I had been anticipating my little lemony afternoon snack. I mean…I love, love, LOVE lemon. In case that wasn’t clear enough…I LOVE LEMON!! So, the knowledge that this was stashed in my desk drawer waiting on that 3 p.m. snack time to strike was anticipation enough. And when it finally came…I tore into it. Pausing only momentarily to take a picture. Lemon. Oh yes…there is lemon. Amazing lemon flavor that is very well balanced by the other ingredients that make up the bar. In fact, it is the perfect blend that keeps the lemon flavor prominent, but not overpowering. Seriously. Delicious. The PROBAR Lemon Fruition bar is composed of organic date paste, brown rice syrup, cashews, gluten-free oats, gluten-free oat bran, chia seeds, and natural lemon flavor. One bite…that’s all it took. I was hooked. I had to share a small piece with my roommate so I could get her opinion as well. And she also gave a nod and actually said it was “really good” instead of her “That’s pretty good.” or “It’s okeedokey.” That meant this had potential. And it really does. The taste is amazing. The texture is soft, but not overly soft. You won’t be sitting there chewing continuously and wondering when you can take your next bite. It’s a perfect blend and a perfect combination. The lemon flavor of this bar lingers on the tongue and really lasts even after you’ve swallowed…all just inviting you to take another bite and experience it all over again. The sweet, tangy, citrus flavor is awesome and meshes beautifully with the oats and cashews, which provide not just texture but a savory flavor to balance toe tartness. This is a true lemon-lover’s dream bar. At first glance, this bar seems very healthy by all aspects. As mentioned before, the entire bar is only 160 calories and contains only 2 grams of fat. The protein punch this bar packs is 3 grams. The filling fiber stands at 4 grams, while the sodium content settles for a very impressive, low 10 mg. However…I’m a bit disconcerted at the 18 grams of sugar that is listed on the label. Sure, much of it comes from the fruit, I’m certain…but that’s a lot of sugar to pack into one bar…no matter how amazing it tastes. But, we all make some sacrifices somewhere. I try to keep my sugar intake a bit lower as an athlete…but 18 grams in one snack bar, while a little higher than I like, isn’t too bad. So, when it comes down to it, I’d be more than happy to try another PROBAR Fruition in one of the seven flavors that are offered. These bars not only come in lemon…but also cherry, blueberry, cran-raspberry, peach, strawberry, and the newest addition…chocolate orange. This snack is definitely a superfood powerhouse and one that I am proud to say…I truly enjoyed. Time to hit up my running store to see what other flavors they have in stock. This entry was posted in Breakfast, Food, Fruit, Gluten-Free, Nuts, Products, Protein Bar, Review, Snacks, Sweet Stuff, Vegan, Vegetarian by The Celiathlete. Bookmark the permalink. 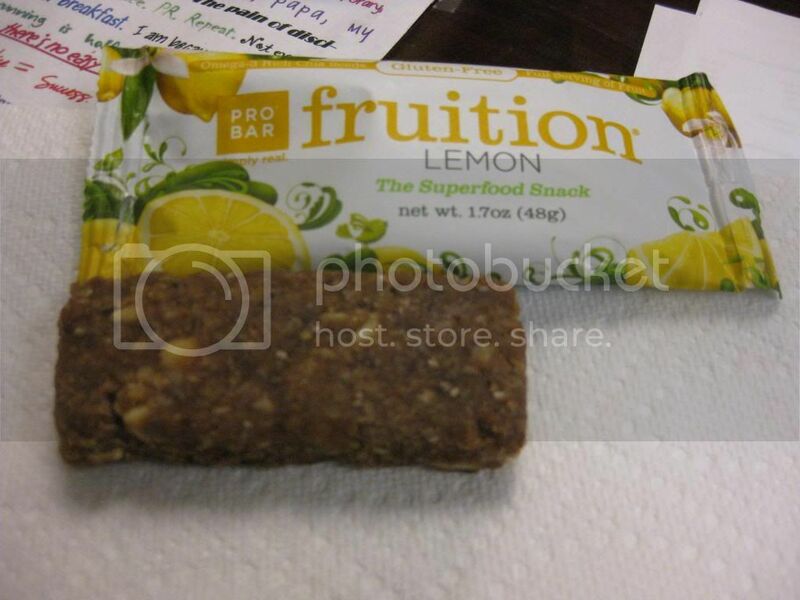 I absolutely love the fruition bars – but I haven’t seen the lemon flavor. Now, I’m on the hung!